Life of Dad/FacebookDads on Facebook are having fun with the #CheerioChallenge. Being a parent is hard, so it’s important to have fun with it when you can. Life of Dad, a Facebook page with over 800,000 followers, started what they are calling the #CheerioChallenge. In this challenge, parents must balance Cheerios on their sleeping children’s heads. And now it’s starting to go viral as parents from all over attempt to cover their children in cereal. We are pretty impressed with the results so far. It turns out that babies are surprisingly good at balancing objects on their faces. This little girl seems to be the champion cereal balancer thus far. She balanced seven stacks of Cheerios, each five Cheerios high for a total of 35 Cheerios. It’s creative, so we’ll allow it. 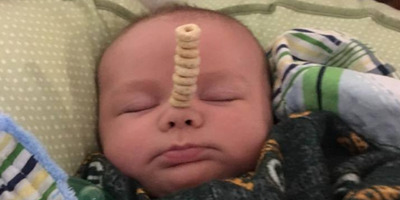 Head over to Life of Dad to see even more examples of the #CheerioChallenge.